Needless to say that AT&T's version of the Sony Ericsson Xperia X10 might've been late into the US market by a few months, but it makes for an even more difficult sell when it's priced at $149.99 on-contract. Although its pricing could've been regarded as appropriate if the high-end Android smartphone were released with an updated version of Android, as opposed to its current state of Android 1.6, it looks as though a couple of online retailers are here for the rescue. Again we see Wirefly and Amazon transforming AT&T's over-bloated price of $149.99 for the Xperia X10 to an eye catching figure of $29.99 – with a new contract obviously. When you think about it, the handset would easily fall in line to pricing traditionally seen with feature phones and some entry-level devices. 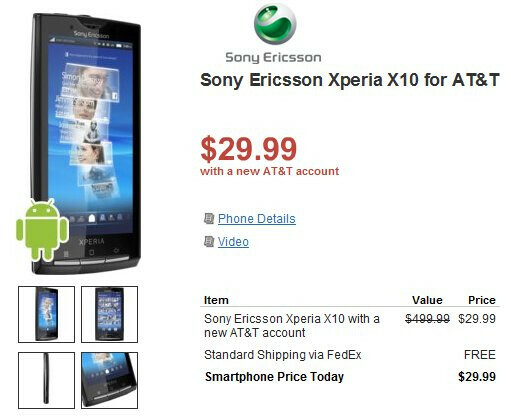 So if you're looking to sign a new 2-year agreement with AT&T, you can consider adding this $29.99 Sony Ericsson Xperia X10 to your list. I agree, this phone is too late to hit the U.S. When it was announced, phone geeks were drooling over it. But since it took so long to come to the U.S. no one really cares since there's phones that are equal or better that are out and have been out. I wish there was a Verizon version, but the Droid X is better, it supports more colors, has more ram and more internal storage than the X10. It's sad really.